I’ve enjoyed every book that I have read in the series. 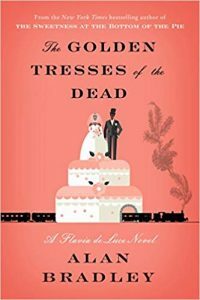 I was captivated by the character of Flavia de Luce right from the very first. Her character has grown considerably even though she is still only twelve years old. She is still working with her poisons which continue to captivate her but she is also actively solving mysteries as part of the Arthur W. Dogger & Associates, Discreet Investigations group (of two – Dogger and herself.) With the maturing of the group, there has been a change in how the mysteries are being solved. Dogger has emerged as a kind of Sherlock Holmes type character. He seems to the the individual who comes up with conclusions while Flavia is more of a Watson type who has access to her laboratory for testing bits and pieces for poison, et al. She sits in admiration as Dogger states the case, proposes action, and comes up with solutions. He also seems to know the chemical essentials of what Flavia will be testing, so Flavia is relegated to almost a technician status. However, she is still front and center as the character of note in the fun and funny happenings that seem to surround this area of England. The character of her cousin, Undine, was a taste of the first Flavia but on steroids. Undine is even younger, is rather obnoxious at times, is incredibly smart (with a photographic memory) and has, for her age, a rather regrettable knowledge of the bad elements of the world. The story is interesting but the solution is just a tad off. While the whodunnit is solved, there is no reference to punishment or proof other than Dogger and Flavia’s say so. Without going into the end, I wish that it was a bit more expanded upon. While it may be that it would be done in the future, the books do not seem to capture what is decided in the courts at later dates. Still, this is a series that I enjoy and I look forward to the next book. If it is the eleventh book in the series or the first in a new one, I will certainly be reading it. 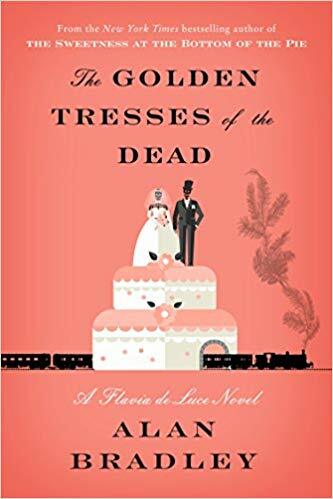 I was provided a digital advance reader copy of this book by the publisher via Netgalley.